Please report any bugs in this version here. The link on the homepage to the bugs thread leads you to the v1.39 thread. we have also located the graphic problem when there is non-protein ligand displayed and implemented a fix to that. So please let us know if you still observe such problems. My first 1.40 unit ended with a computation error. Exiting numerous times but no \"finished\" file. 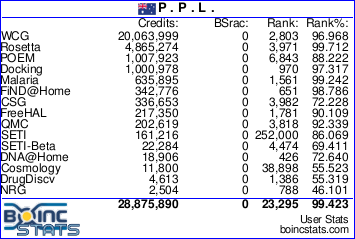 Boinc said to reset project. P . P . L .
98.050% my run time is 6hrs i haven\'t had this big a margin to finish before. Could it be the new mini app 1.40 or the task? I\'ll let it run to end. I have had one of these, too, but have now aborted it. This task ran smoothly for 2 hours, but ended up with a validate error. I\'m just having a similar problem as above. 2008-11-09 09:36:45|rosetta@home|If this happens repeatedly you may need to reset the project. 2008-11-09 12:16:03|rosetta@home|If this happens repeatedly you may need to reset the project. Just before the second restart, it had a progress near 60% and it was on a \"model 1\" 11000+ step, I guess unfolding/testing a beautifully folded protein (step around 10000 had a lower \"low energy\" than 11000) - I\'ve made a snapshot. When it restarted, it began from something like 18% and a still not enough folded protein. The time elapsed has been reduced as well. What I would like to ask first is to add some checkpoints, it would help to process and bugtest. Now I am waiting to check if this workunit is endable. Message 56782 - Posted: 9 Nov 2008, 13:39:32 UTC - in response to Message 56781. Now I am waiting to check if this workunit is endable. The Workunit restarted third time, seemingly in the same place as the previous time (the percentage \"completed\" was higher but I was checking a couple minutes earlier and it was once again step 10000 then, so now it was probably 11000). The WU started for the fourth time, now with 24% but I guess it was the same moment as before. When I restarted the WU after temporarily halting once again, it went back to 17%. Now I can see 18,23% and step 523. Now I am halting this task and my business with Rosetta. The problem seems to be with a higher memory usage although one of the mods recently assured us that there is no increase in memory requirements. I could increase amount of memory dedicated to BOINC, however I would like to have this problem explained and ironed out. Frankly speaking, as this is just a next computational problem in a few days, any explanations from Rosetta developers/maintainers would be highly appreciated. Thanks for your co-operation and good luck. Too many restarts with no progress. Keep application in memory while preempted. Well, looks like 2 errors: Too many restarts & file_xfer error. Be aware: I\'m running WCG\'s (beta-)BOINC 6.2.25, which seems to be pretty stable (so far). ERROR: NANs occured in hbonding! Message 56792 - Posted: 9 Nov 2008, 19:21:12 UTC - in response to Message 56779. I grabbed a few WUs on both an XP and Linux m/c. Both have the same problem for me, in that they get to around 98% complete, then seem to just hang there. Completion does not take place and I have aborted all 1.40 WUs on both PCs for now. Message 56793 - Posted: 9 Nov 2008, 19:30:28 UTC - in response to Message 56792. ......they all seem to finally stick with 9m 53s to the end of the WU. Message 56794 - Posted: 9 Nov 2008, 21:25:25 UTC - in response to Message 56779. Well it finally finished after 11hrs not very happy, something needs to be fixed. b.t.w the credit is a bad joke. 1hzh_1a58_fchbonds_20_30sarel_SAVE_ALL_OUT_4704_87_0 and it has now been working on it for 14 hours and 24 minutes and it has reached 98.840%. I am sure that I will get very low credit for it like the others in this thread. Until the mess has been sorted out/properly explained I\'m crunching for another project. I\'m going to visit the forum frequently as Rosetta@Home is my favourite project. slow as wet cement about .001% every 10 sec better then the last one but not much. I bet i don\'t get much for it if & when it finisher\'s. Message 56800 - Posted: 10 Nov 2008, 6:16:10 UTC - in response to Message 56786. Last night, it had accumulated about 6 CPU hours and claimed that it would finish in another 10 CPU minutes. This morning, it has accumulated over 12 CPU hours and claims that it will finish in another 9 CPU minutes and 56 seconds. Also, it\'s currently the most memory hungry process on my machine. The Windows Task Manager recently said it was using over 256,000K of memory - over 10 times as much as the next process - but then dropped that to a little over 200,000K and is now 223,132K. Since it hasn\'t let any other process take a turn in its CPU core for much longer than the 2 hours I\'ve tried to set it for, I\'ll suspend it for a while and see if that helps. The other person with a similar workunit had a compute error after about 6 CPU hours. Message 56804 - Posted: 10 Nov 2008, 13:49:00 UTC - in response to Message 56802.
it say that it will finish in 9minuter and 51 sec. But by me is accumulates only 5 hour 5 min, but las hour it is the same. \"mini\"rosetta mem usage -cca 290,000 K, VMsize - 320,000 K!! !